It isn't simple finding your way out in the relationship scene as a celebrity. When a celebrity does find "the special one," being on the radar of the public can add stress to any relationship. Popularity can make the problems of a couple skyrocket into the headlines, revealing their private lives to everyone who follow the tabloids. Resulting from this, there are prominent couples that have understandably kept their lives under wraps, despite the viral way social media can become. On the flip side, there have always been celebrities who enjoy the drama social media can become in its viral nature. Those that love the attention even use their fame to brag or to sell a staged truth. Below, we probe 3 interestingly private celebrity couples and how they live away from the headlines. We will also identify 2 "extreme" couples, what makes their relationship work and how they are perfect for each other. We are not going to be judgmental here. Some people are madly in love with fame. Now these are two big names in their respective industries, and are a definition of a humble power couple. However, Beverly and Eugene Baah don't show off the fact that they are stars in their crafts, or that they happen to be married. Although the couple have had two daughters over the course of years, they have been together. They on share what must be shared on social media. That seem to work for them. One is a colourful gospel singer, and one is a politician, also with an appetite for drama. Yeah... Gifty and Hopeson Adoye are perfect for each other. It wasn't until Gifty dramatically ended her marriage of 10 years, with prophet Prince Elisha Osei that she realized her feelings for Hopeson. They got married in a flamboyant ceremony, from that time till date, the gospel musician has happily being heaping praises on her new husband on Instagram. The hostess for the ceremony was none other than Afia Schwarzenneger. Both of them come from previous marriage. With Mr. Adoye having lost his former wife some time ago. Let's be factual, it isn't easy keeping your relationship from the public in the age of social media, especially when the two are celebrities. The couple is so private, nonetheless, that how or when they first started dating nobody knows. As a solo act, John Dumelo hasn't had the best relationship with the media. However, the movie star has matured over the years. Plenty of that has to do with him being in love with his wife, Gifty Mawunya Nkornu. Gossip has it that, he was once dating his colleague actor-James Gardiner's cousing before meeting his wife. More drama! John Dumelo has opened up about how their first child was born unplanned, six months after his marriage to Gifty. 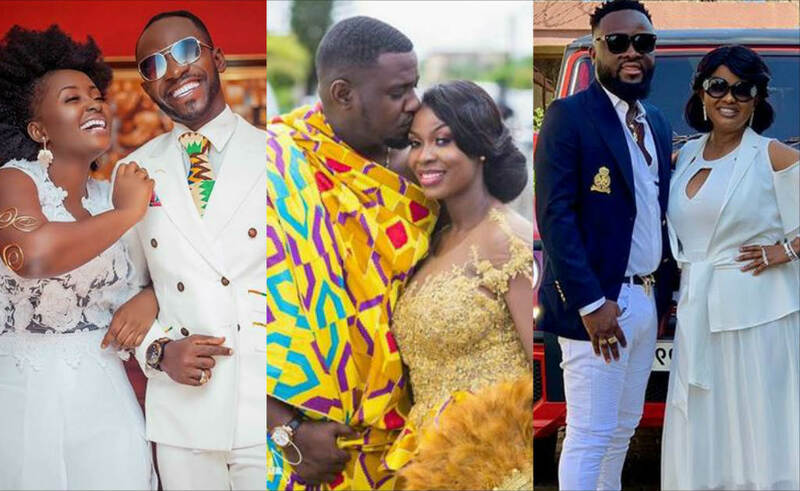 You might say that Okyeame Kwame and Annica Osei-Apau had rehearsed life after wedding long before they wed. You will love the photoshoots of this couple but they are super-private about their personal lives. They have two children- Sir Bota and Sante. It is ok to assume that the couple's photos are way above average whiles keeping their family life discrete.